U.S. Treasury agents set out to break up a narcotics-smuggling ring. I got the opportunity of seeing this series recently on a late night cable channel,but this seldom seen produced Jack Webb crime-drama series hasn't been seen since the last time it was showed(and this was back in the mid-80's when it ran on cable's USA Network--the series that is). However,this is the two hour pilot for the TV-series which originally ran in the early 1970's. This show was like the other TV shows Webb produced since it went strictly by the book in procedures and manuels and to apprehend the baddies who were braking the law. 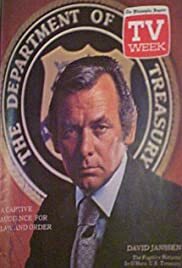 David Janssen portrays a government U.S. Treasury official who was in charge of the overall operations of the U.S. Treasury Service. He and the others that worked in his department were in charge of catching those individuals who were in the act of suspicious activities(including counterfeiting and in some of the episodes drug laundering and armed robbery,etc.). Catch it when it comes on your local cable channel.